C.J. Mahaney's recommended reading list for pastors. I especially affirm #12. Also: C.J. on "Interrogating the Legalist Within." Ligonier is streaming the videos of Together for the Gospel from two years ago. All through Mark 2 and into chapter 3 Jesus is barraged with questions from doubters, and it's interesting to note that all but one time he himself responds with a question. 2:1-12 - Jesus heals the paralytic lowered through the roof and declares his sins forgiven. Scribes: "Who can forgive sins but God alone?" Jesus: "Why do you question these things in your heart? Which is easier...?" 2:13-17 - Jesus eats with sinners and tax collectors. Scribes: "Why does he eat with sinners?" 2:18-22 - Jesus' disciples are conspicuously not fasting. People: "Who do John's disciples and the Pharisees fast, but your disciples don't?" Jesus: "Can the wedding guests fast while the bridegroom is with them?" 2:23-27 - Jesus' disciples pluck grain in a field on the sabbath. Pharisees: "Why are they doing what isn't lawful on the sabbath?" Jesus: "Have you never read what David did...?" 3:1-6 - Jesus enters the synagogue and heals a man with a withered hand on the sabbath. This time Jesus initiates the question, noticing that "they watched Jesus, to see whether he would heal him on the sabbath, so that they might accuse him" (3:2). Jesus: "Is it lawful on the sabbath to do good or to do harm, to save life or to kill?" Doubters: "But they were silent" (3:4). What do you make of this? This seems to be climactic in some way because it is finally at this point that "the Pharisees went out and immediately held counsel with the Herodians against him, how to destroy him" (3:6). Jesus always had a response, and almost always seems to have put the ball back in the court of his interlocuters, implying that it was they who needed to answer and give an account, not Jesus. Jesus always had a response; the doubters did not. The Brooklyn Tabernacle in New York City has from day one in 1971 been structured centrally around a Tuesday night prayer evening, in which I had the privilege of participating a few years ago. Pastor Cymbala discusses. A remarkable contrast emerges: whereas the new perspective strategy consists in narrowing down the issue, to zero in on what was really of burning interest to Paul, Jew-Gentile relations, Paul's strategy constantly seeks to broaden horizons and to bring into the discussion the more global truths of the gospel. --p. 488 of "Justification of the Ungodly: Theological Reflections," in Justification and Variegated Nomism, Vol. 2. That's one of a dozen or so equally helpful quotes from a chapter for which I'm very thankful. Listened today, once again, to this message from Zack Eswine, my old homiletics prof at Covenant Seminary. So helpful. Cardiologically deconstructive. In Matthew 22 Jesus finds himself on the receiving end of a number of tests. First the Pharisees ask a tough question about paying taxes to Caesar or not - political testing. Then the Sadduccees approach Jesus to ask about the seven brothers who were all married to the same woman and the state of this strange marital situation in the afterlife - theological testing. Next, the Pharisees once again take Jesus on, this time asking which commandment is the greatest - moral testing. Finally, Jesus turns the tables on his interrogators. He asks them a question: whose son in the Christ? The son of David, they say. Then how, asks Jesus, can David call him Lord in Psalm 110? "And no one was able to answer him a word, nor did anyone dare from that day on to question him any longer" (22:46). Read this today at the very end of Edwards' multiple-part sermon series of 1734, "Justification by Faith Alone." This series was instrumental in the local revival God sent to Northampton in 1734-35. This quote comes from the fifth and final section of JBFA, concerning "the importance of the doctrine," in which Edwards is explaining how a works + faith = justification view of the gospel "derogates much from the honor of God." [S]eeing we are such infinitely sinful and abominable creatures in God's sight, and by our infinite guilt have brought ourselves into such wretched and deplorable circumstances, and all our righteousnesses are nothing, and ten thousand times worse than nothing (if God looks upon them as they are in themselves) is it not immensely more worthy of the infinite majesty and glory of God, to deliver and make happy such poor filthy worms, such wretched vagabonds and captives, without any money or price of theirs, or any manner of expectation of any excellency or virtue in them, in any wise to recommend them? Will it not betray a foolish exalting opinion of ourselves, and a mean one of God, to have a thought of offering anything of ours, to recommend us to the favor of being brought from wallowing like filthy swine in the mire of our sins, and from the enmity and misery of devils in the lowest hell, to the state of God's dear children, in the everlasting arms of his love, in heavenly glory? Is that good or what! I was absolutely fascinated and very encouraged to see how Thomas Aquinas (1225-74) answered his own proposed question (which is the modus operandi of the entire Summa) of "Whether a Man Can Fulfill the Commandments of the Law by His Natural Powers, without Grace." I answer: there are two ways of fulfilling the commandments of the law. In the first place, one may actually do what the law commands, by performing acts of justice or fortitude, for example, or other acts of virtue. Man could fulfill all the commandments of the law in this way when he was in the state of pure nature, since he would not otherwise have been able to avoid sin, which is nothing other than transgression of the divine commandments. But a man in the state of corrupt nature cannot fulfill all the divine commandments without healing grace. In the second place, the law may be fulfilled not only in respect of what it commands, but also in respect of the manner of action. It is fulfilled when actions are inspired by charity [love]. A man cannot fulfill the law in this way without grace, whether in the state of pure nature or in the state of corrupt nature. Amen and amen! This is almost exactly what C. S. Lewis says in his essay "Three Kinds of Men," which I discovered and commented on here. What a vital truth, one shot through the entire Bible, OT and New. How often I fall into externalized, backpatting, self-congratulatory, misery-inducing, joy-depleting obedience which is not obedience at all but Pharisaism. Maybe you do too. Let's remember Thomas' words. Interesting series of short posts (4 so far) from our friends at the JE Blog on Edwards' understanding of the "new spiritual sense," espeically as laid out in his sermon "A Divine and Supernatural Light." Yesterday I noticed striking parallels in the first two paragraphs of Matthew 14, which are almost exactly the same length (vv 1-12 = 170 words, vv 13-21 = 157 words). The first account is of Herod at a party, who on a promise to a dancing girl has John the Baptist beheaded (this is Herod Antipas, one of 3 sons of Herod the Great, along with Philip, mentioned in v. 3, and Archelaus). The second is of Jesus feeding the 5,000. I think Matthew is deliberately contrasting the two characters. The great difference, of course, is that Herod was self-serving (didn't want to disappoint his guests, so he murdered), Jesus was other-serving. Herod was inspired by the allure of a dancing female; Jesus was inspired by the desperate need of the people. Herod brought death; Jesus brought life. In the next few days I'll review Richard Bauckham's most recent book, a very helpful study of John's Gospel called The Testimony of the Beloved Disciple: Narrative, History, and Theology in the Gospel of John (Baker, 2007). In the meantime here is a fascinating quote as he illumines for us the staggering degree of love and the breathtaking example of service of John 13. For the ancients, footwashing was as necessary and regular a chore as brushing teeth is for most modern people. Feet were protected by no more than open sandals, and so, after walking in the heat and in the dust and dirt of country roads or town streets, washing feet was necessary both for comfort and for cleanliness, especially before sitting down to a meal. Footwashing appears in the literature . . . as a duty of hospitality, either to expcted guests or to passing strangers. . . . But it was certainly not a host's duty to wash his guests' feet himself. Either a slave or a servant would do it, or the host would provide a basin of water and a towel for the guests to wash their own feet. Washing someone else's feet was an unpleasant task, which no one except a servant or slave could be expected to do. So menial a task was it that in a household with a hierarchy of slaves and servants, it would be the duty of the slaves, not of the servants who performed less demeaning tasks such as waiting at table. It was, in fact, the quintessentially servile task, the one thing that no one else would do. In a household without servants, everyone washed their own feet. . . . I find myself rebuked. The implication for us is unavoidable: what kinds of lowly things might we regularly do that would please the Lord (as an already approved child would seek to please his father out of love, not as an employee-on-the-ropes would seek to please his boss out of anxiety)? How might we follow his example, as Jesus exhorts? For most of us, we would do well to start in our marriages and in our homes, in acts of service that will receive no human accolades or attention, but will serve others, please God, and, doubtless, surprise us with a new and fresh joy. Interesting reflection from Sam Storms on Jesus' ability/inability to sin. I've been intrigued before by Sam's proposal that Jesus' obedience, miracles, and entire life knew such victory and joy and the supernatural not because he was God (though he was), but because he was a man living in total reliance upon the Spirit--a suggestion which if valid suddenly makes Jesus' example supremely relevant to our own lives in a way that the Jesus-doing-miracles-because-divine portrait doesn't. I offer the following review of Scot McKnight's interesting new book, A Community Called Atonement. I invite comments if I've been unfair in any way or overlooked any major strength or weakness in your mind. I'm still digesting the book and need all the help I can get. Among our most helpful thinkers in current New Testament studies are those who have conscientiously bridged their NT expertise with other disciplines—scholars such as Richard Bauckham (with historiography), D. A. Carson (with cultural studies), and Anthony Thiselton (with hermeneutics). To this mix can be added Scot McKnight, bridging the gap between NT scholarship and the increasingly influential emerging church (EC). Already known to those familiar with the EC through his thickly-trafficked blog (from which I have personally profited numerous times), McKnight has provided what may be the most significant biblical and theological rationale to date for some of the distinct emphases of the EC, such as kingdom, community, and praxis. A Community Called Atonement is part of a new series entitled Living Theology edited by Tony Jones, national coordinator for Emergent. McKnight is Karl A. Olsson Professor in Religious Studies at North Park University in Chicago. The book is divided into four parts. Preceding these is an introductory chapter that sets the tone and gets the main themes to come out on the table, particularly (1) that atonement is not making the difference in the lives of Christians it ought to, and (2) that the reason for this lack of atonement-fueled transformation is the failure to incorporate all the metaphors for atonement into a coherent whole. The rest of the book, promises McKnight, will attempt just such a holistic enterprise. Part One lays the foundation for the book, beginning (ch. 2) with a discussion of Jesus’ teaching on the kingdom of God, which is “the society in which the will of God is established to transform all of life” (9). McKnight skims through Luke-Acts to explicate what he calls what he calls “the Lukan thread,” demonstrating “that atonement is only understood when it is understood as the restoration of humans—in all directions—so that they form a society (the ecclesia, the church) wherein God’s will is lived out and given freedom to transform all of life. Any theory of atonement that is not an ecclesial theory of the atonement is inadequate” (9, emphasis original). Chapters three and four add six more starting points to the theme of kingdom, three in each chapter. Chapter three addresses the perichoretic union of God in the Trinity, highlighting the relationality of this union into which believers are drawn; introduces the book’s pervasive metaphor for sinners, that of “cracked Eikons,” a critical point of which is that as Eikons (images) of God humans are co-missional beings with God; and describes sin as “hyperrelational” since it disrupts not only humanity’s relationship to God but also to oneself, others, and the world. Chapter four’s final three foundation stones are eternity, which is described in strictly corporate terms; community, delineated in the three societies of Israel, kingdom, and church; and human performance or praxis as integrally connected to God’s role in atonement. Having laid a seven-step foundation, McKnight moves on in Part Two to discuss atonement itself. Chapter five explores the role of metaphor in exegeting atonement, arguing for a more rhetorically sensitive approach to the function of metaphors on the way to making the larger point that one metaphor must not trump all others in our understanding of atonement. Penal substitution provides an example of this danger. In chapter six McKnight issues a call for humility, recognizing not only that all of us are culturally located but also that the “mind-numbing complexity of sin” makes atonement difficult to grasp (48). Chapter seven draws on Paul and Luther to affirm that “[t]he cross is the center of the atonement” (51). Chapter eight then illumines the atoning function of the incarnation through a discussion of various biblical texts, after which the author makes connections between the incarnation and atonement by brief looks at the themes of Jesus as the perfect Eikon, Jesus as the second Adam, and union with Christ. Chapter nine returns to the cross to draw on Mark and Paul in suggesting that the cross “is the work of God to restore cracked Eikons to union with God and communion with others for a missional life focused on others and the world” (61). It is in this chapter that McKnight comments on the appropriateness of speaking of God’s wrath. Chapter ten closes out Part Two by addressing Easter and Pentecost and arguing that the resurrection is no less crucial to atonement than the crucifixion. Part Four concludes the book by suggesting various avenues in which this understanding of atonement gets lived out. Chapter fifteen explains that believers embody and extend God’s atoning work by engaging in missional love that seeks the holistic welfare of the social context in which we live. Justice is the focus of chapter sixteen, and is reworked to denote systemic justice that is restorative and relational “in the here and now” (132) rather than merely divine reprisal. Chapter seventeen fleshes out what it means to be “missional.” Drawing on Brian McLaren, McKnight explains that just as God’s mission is to seek out and restore the whole person, so this mission forms the sacred summons of the Christian. In a helpfully articulated distinction, we are to be missional (going into the world) rather than “attractional” (waiting for the world to come to us). Chapter eighteen addresses the role of Scripture in atonement, provocatively declaring that “some Christians . . . ascribe too much to the Bible” when they should be starting with and centering on the Trinity (143). Scripture itself, moreover, is missional, “designed by God to work its story into persons of God so that they may become doers of the good” (147). Finally, chapter nineteen explores the atoning significance of prayer and the sacraments. Perhaps a few lines from the middle of the book contain the best self-described summary of the book: “This book is dedicated to deconstructing one-sided theories of the atonement. It is also dedicated to demonstrating that the cross is inseparable from the incarnation and resurrection of Jesus, Pentecost, and the ecclesial focus of the work of God. And this book is dedicated to deconstructing simplistic, individualistic theories of the atonement” (61). A Community Called Atonement possesses several notable strengths, regarding both style and content. Stylistically, McKnight has written a clear and accessible book that refuses to make thoughtful reflection and a fast-moving pace mutually exclusive. The book’s brevity and clarity will encourage college students to work through it, while its fresh yet theologically responsible recasting of core doctrinal categories will equally appeal to senior scholars. Second—and this can hardly be overemphasized—McKnight has worked constructively rather than in theological attack mode. He has written in love. Both advocates of and objectors to the EC can learn from this example. Indeed, if 1 Corinthians 13 is more than a wedding text, the importance of this point outweighs even issues of content, whether of strengths or weaknesses. A third strength, moving to analysis of content, is the book’s inclusive integration of multiple perspectives on the atonement. Too often advocates of a particular view of the atonement neglect the full-orbed balance McKnight seeks to cultivate. Fourth, the book’s challenge for the Church to actively seek out unbelievers rather than passively (and naïvely) hope unbelievers seek out the Church remains a timely challenge to evangelicals. (Getting Christians out into the world, of course, does not address the reciprocal problem of how to get the world out of the Christians.) The book’s focus on joining God in his quest to seek out broken-yet-divinely-imaged people, helping to restore them in all the various anthropological dimensions, continues to be an urgent reminder of what is an undeniably central biblical imperative. Christian witness must not be limited to the dichotomous care for the “soul” while neglecting physical and material needs. Fifth, the book’s consistent emphasis on union with Christ as a soteriologically comprehensive category (59-60, 109-10) is a vital and urgently needed focus in light of current NT discussions (not least those regarding justification). Sixth, McKnight’s emphasis on the corporate nature of the church and the way God seeks to create a worshipping community through atonement is thoroughly appropriate in the individualized culture in which we Westerners live and to which so many recent writers are currently pointing. I bless God for Scot McKnight. We are, in the most important sense, on the same team. Weaknesses, nonetheless, should also be noted. Indeed, some of this book’s strengths are its weaknesses. We have just noted, for example, that McKnight extols the corporate nature of atonement. This is at the heart of the book and the point of its title. Yet at times he appears to fall into the common trap of failing to appreciate the complementary truth that the transformation of individuals, while neither possible nor consummated apart from ecclesial incorporation, is foundational to the transformation of the community. The constant assertions that “the atonement cannot be restricted to saving individuals” and that “atonement is designed to create . . . community” (75) make an important point, yet may paint a portrait as one-sided as the one being replaced. If some have neglected the corporate aspects of atonement, others in responding have neglected the individual. Is it biblically accurate, for instance, to depict eternity as “so corporate that individuals simply are unrecognized” (26, emphasis original)? Second, McKnight fuzzies the lines between atonement proper and its effects, making theologically conscientious reading produce, if not outright objection, at least head-scratching puzzlement. To be sure, one must not allow distinction between atonement and its results to become separation—a real problem indeed. Yet McKnight goes too far the other way when he says, for example, “atonement is not just something done to us and for us, it is something we participate in—in this world, in the here and now. It is not just something done, but something that is being done and something we do as we join God in the missio Dei” (30-31, emphasis original). McKnight elsewhere adds that reading Scripture (148), partaking of the Lord’s Supper (154), and prayer (154) are all atoning. While we appreciate the desire to motivate Christians to live out the atonement they themselves have professedly experienced, such statements come perilously close to suggesting that it is we who do what must only be attributed to the Triune God. 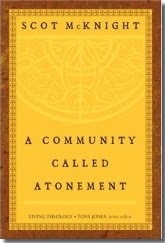 McKnight seems to widen the communicative content of atonement to such an extent that one is not sure what it means beyond a generic sense of “edification” or “blessing.” At numerous points I wondered why the book is labeled A Community Called Atonement and not, say, A Community Called Blessing. McKnight’s explication of the “Lukan thread” compounds one’s puzzlement as he skips over the very passages that are arguably most germane to a discussion of atonement—namely, Passion Week in Luke and pivotal sermons in Acts (2:38; 5:31; 10:43; 13:38). Third, McKnight’s image of the golfer and his various clubs in depicting the different metaphors for the atonement is both effective and misleading. Throughout the book this image is employed to communicate that we must not utilize only one club in the bag to the exclusion of the others. Yet while this analogy makes McKnight’s point that multiple perspectives on the atonement must be recognized, it prevents the nuance needed in grasping the biblical message concerning atonement. For what if a single club (penal substitution? sacrifice?) is not merely one club among equals but that which allows all the clubs to be effectually used? Is it possible to be reconciled to one another or to be freed from the cosmic forces of the world without a prior, more fundamental reconciliation, in which sin is decisively, if not finally, dealt with? Yet the argument made is that we need to give all aspects of atonement an equal place at the table. We appreciate the impulse to expose the theological tunnel vision concerning atonement that views it only as concerning the individual and God; yet might not one element nonetheless remain the fundamental one, rather than one “golf club” among many? Perhaps, then, we would need a more nuanced analogy. Perhaps medicine would do: what if an individual suffering from a host of various maladies, daily taking various corresponding meds, is required at the start of each day to ingest a pill that activates all the others? Or could the various theories of the atonement can be likened to doors lining a hallway which nevertheless contains one main door leading into the hallway itself and thus foundational to accessing the other doors? Either of these images would indicate both that we must not restrict ourselves to a single metaphor—the other pills must be taken, the other doors must be opened—and that one metaphor is foundational to the others. Despite these reservations, A Community Called Atonement is an accessible and stimulating study that is worthy of reflection and will doubtless ignite invigorating and fruitful discussion. Tony Jones writes of the volumes of this series that “they’ll raise as many questions as they answer” (ix). The series’ inaugural installation lives up to his prediction. Whether this is goal-worthy, which appears to be Jones’ assumption (after all, it will “promote a way of doing theology—one that is conversational, collegial, and winsome”), is less certain. The best trait of the EC is its insistence on proactively living out Jesus’ kingdom vision of caring for the world in ways both immaterial and material, and the main weakness of the EC is unnecessarily fuzzying biblically-generated doctrine on its way to commending such a way of life. This book exhibits both. Having registered a few concerns, however, it is my sincere hope that the daily life outlined by McKnight—marked not only by reconciliation with God but also practical love for and service toward fellow Eikons—becomes increasingly embodied in my own life and in that of the twenty-first century Church. Incredible, heart-exposing quote on moral pride. Never noticed this before. In Matthew 4, at the conclusion of Jesus' third temptation by Satan (which, we remember, portray Jesus not as the supreme stoic or embodiment of self-control but as passing the very tests wandering Israel failed so miserably, as you and I have; hence the texts from Deuteronomy Jesus cites), Jesus uses the exact same words in Greek--translated "Get behind me, Satan!" --that he later uses toward Peter in 16:23. Remember, the third temptation was to bow down and worship Satan and be given all the kingdoms of the world, and the context in ch. 16 is Peter forbidding Jesus undergo the death Jesus has just predicted. I notice: both the devil and Peter offer Jesus a suffering-free path to glory. And in both cases it is equally satanic, whether coming from the devil himself or the Rock on which Jesus built his church. Wow! Another excellent blog commences life, by another equally dashing fellow who teaches here, and who, despite being wittier than me, will, as with previously mentioned bloggers, never beat me in basketball (but perhaps in ping-pong). Have you ever seen the sun shining and snow falling at the same time? I just did for the first time in my life. I expect there will be a part of the new earth where this is always happening. Un-capture-able with words, except that it looks like tiny pieces of brilliant crystal floating down to earth. Impossible to look directly at even one of them, yet millions fill the sky. One of those quiet, unspoken joys that is actually a longing--as C. S. Lewis has taught me, this is true of all our deepest joys in this world; they are longings for another. The deepest happinesses are not attainments but yearnings. Among many other mercies and joys, one that must not go ignored, as I have reflected today on 2007, is the grace of God in giving me my wife of 6 years, Stacey. She loves Christ, wants to do his will, loves me, seeks to know how better to support and be a bulwark for me, and ignites our life with happiness. If there is one thing I bless God for about her, I think it is her happiness. She spreads it everywhere. And 2007 was a happier year for me because of her. Under God I call her blessed.